Interim distribution: Kamalul (left) and Nor Azamin at the announcement of the first AHB income distribution for this year. KUALA LUMPUR: Pelaburan Hartanah Bhd (PHB), a subsidiary of Yayasan Amanah Hartanah Bumiputra, will inject a RM1.4bil shopping mall and office tower project in KL Sentral into its portfolio of assets under the Amanah Hartanah Bumiputra Unit Trust Fund (AHB) next year. PHB managing director and chief executive officer Datuk Kamalul Arifin Othman said the shopping mall or Lot G was currently under construction and expected to be completed by year-end. “We will have to achieve the right rental yield for Lot G, the single largest property owned by PHB in terms of value, before injecting it into AHB. “Once Lot G is included in the portfolio, we could offer more AHB units to be subscribed,” he told reporters after jointly announcing AHB's income distribution for the six months ended March 31 with its manager Mayban Investment Management (MIM) Sdn Bhd yesterday. AHB is a first of its kind fixed-price syariah-compliant real estate backed unit trust fund which enables bumiputra investors to participate in the ownership of real estate assets with a minimum investment of RM500. Unlike other unit trust funds, assets under AHB have to be acquired first before the units can be subscribed to. Other than Lot G, Kamalul pointed out that PHB was also working on a property development project with Gleneagles Hospital Kuala Lumpur. “The project involves the extension of Gleneagles Kuala Lumpur covering a total gross floor area of approximately 300,000 sq ft. The gross development cost of this extension is approximately RM138mil and should be completed in 2014. “It will have a new 10-floor healthcare facility being built with a lease period granted to Gleneagles Kuala Lumpur to occupy the same for 15 years with an option to renew for another 15 years. “Other than that, we also have a long-term plan to develop our 20 acres of land along Jalan Bangsar into an integrated development,” he said. Besides these three developments, Kamalul added that PHB would continue to source for new assets to be injected into AHB. “To provide our investors with a good and consistent income stream, PHB is looking to buy more completed and income-yielding assets, expand its land-bank and venture into more property development projects. To date, PHB's completed list of properties include DEMC Specialist Hospital, Block D of Peremba Square in Saujana Resort, Menara Bumiputra-Commerce in Jalan Raja Laut, CP Tower in Petaling Jaya, Wisma Consplant in Subang Jaya, Tesco Setia Alam, Menara Prisma in Putrajaya and Logistics Warehouse in Shah Alam, which collectively are valued at RM1.4bil. 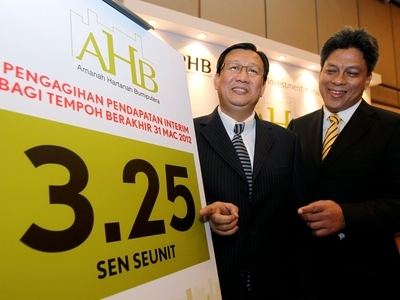 For the six months ended March 31, PHB declared an interim income distribution of 3.25 sen a unit which would involve a total payment of RM32mil for AHB unit holders. This translates to an annualised income yield of 6.5% when benchmarked against the 12-month General Investment Account-i of Maybank Islamic Bhd. AHB's income distribution, if any, is payable on a six-month basis for periods ending March 31 and Sept 30 each year and is tax-exempt. The first payout for this year and the third since it was launched would be directly credited into the unit holders' bank accounts. MIM managing director and chief executive officer Nor Azamin Salleh said the tremendous response from the investors proved that the fund was a suitable investment option among bumiputra investors as it offered participation in the beneficial ownership of real estate assets, competitive returns at a low minimum entry point. AHB was launched in November 2010 by Prime Minister Datuk Seri Najib Tun Razak. And as the fund units are fully-subscribed, the public is advised to enquire with any Maybank branch for units which are made available.